The nonagenarian mother of former president Paa Kwesi Bekoe Amissah-Arthur, has made a special prayer for former president Mahama. 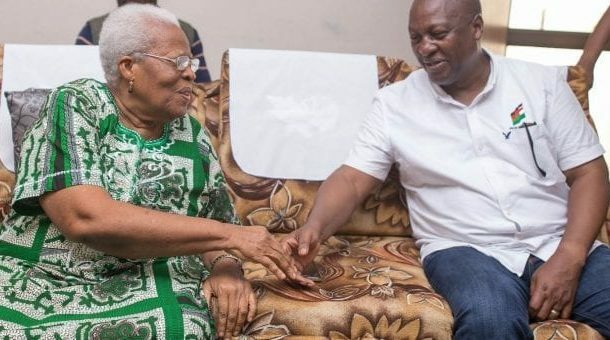 Mahama and his entourage who were embarking on a familiarisation campaign in the Central Region paid a courtesy call on the old Amissah-Arthur’s mother. The old woman prayed that Mahama’s enemies would be put to shame. She was hopeful that the former president would win the 2020 elections, which would shock his enemies. Amissah-Arthur’s mother was said to have carried out a powerful prayer session when he was called upon, assuring Mahama that it will be well with him. She reportedly prayed: “Dear God give him wisdom, dip him in your sacred blood, get them united to fight for the common progress of Ghana…we trust you to destroy anything that will work against them." Also, Nana Okai Bekoe, the acting Odekro of Otuam Traditional Area, where the former late president Evans Mills hailed from, also predicted victory for Mahama. He prayed that the spirit of the late president, and also his kinsmen would be with Mahama to win victory in election 2020.